You've now added Paddle Sports Center to your itinerary. 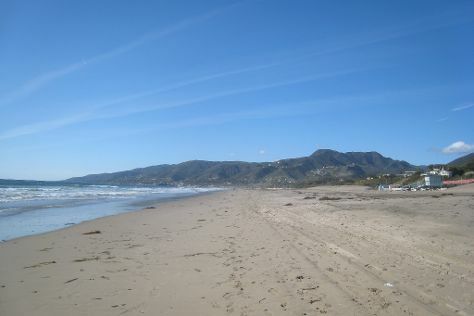 Visiting Zuma Beach and Santa Barbara Zoo will get you outdoors. Visit Old Mission Santa Barbara and State Street Underpass for their historical value. Change things up with these side-trips from Santa Barbara: Solvang Taxi and Wine Tours (in Solvang), Ronald Reagan Presidential Library and Museum (in Simi Valley) and Nicholas Canyon Beach (in Malibu). To find reviews, traveler tips, where to stay, and tourist information, go to the Santa Barbara vacation maker . Pleasanton to Santa Barbara is an approximately 5-hour car ride. You can also fly. Expect slightly colder weather when traveling from Pleasanton in June: highs in Santa Barbara hover around 72°F, while lows dip to 56°F. Cap off your sightseeing on the 26th (Wed) early enough to travel to Pleasanton. Pleasanton is a city in Alameda County, California, incorporated in 1894. To see photos, more things to do, reviews, and other tourist information, read Pleasanton trip planner . You can drive from Santa Barbara to Pleasanton in 5 hours. Another option is to fly. Expect a bit warmer weather when traveling from Santa Barbara in June: highs in Pleasanton hover around 87°F, while lows dip to 56°F. You will leave for San Francisco on the 27th (Thu). Your day-by-day itinerary now includes California Academy of Sciences as well as Golden Gate Bridge. Start off your visit on the 27th (Thu): snap pictures at Golden Gate Bridge, then take a stroll through Fisherman's Wharf, and then engage your brain at California Academy of Sciences. 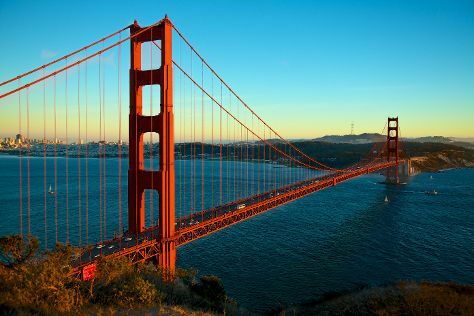 To see where to stay, reviews, and more tourist information, refer to the San Francisco trip site . Getting from Pleasanton to San Francisco by car takes about an hour. Expect a bit cooler weather when traveling from Pleasanton in June: highs in San Francisco hover around 71°F, while lows dip to 55°F. Finish up your sightseeing early on the 27th (Thu) so you can travel to Pleasanton. For where to stay, photos, traveler tips, and more tourist information, refer to the Pleasanton road trip app . You can drive from San Francisco to Pleasanton in an hour. When traveling from San Francisco in June, plan for a bit warmer days and about the same nights in Pleasanton: temperatures range from 87°F by day to 56°F at night. You will leave for Stanford on the 28th (Fri). Stanford is a census-designated place (CDP) in Santa Clara County, California, United States and is the home of Stanford University. Start off your visit on the 28th (Fri): take in the architecture and atmosphere at Stanford Memorial Church, then shop like a local with The Stanford Shopping Center, and then gain insight at Hewlett Packard Garage. For ratings, where to stay, reviews, and other tourist information, you can read our Stanford trip planner. You can drive from Pleasanton to Stanford in an hour. While traveling from Pleasanton, expect a bit cooler days and about the same nights in Stanford, ranging from highs of 76°F to lows of 59°F. Finish your sightseeing early on the 28th (Fri) to allow enough time to travel to Pleasanton. For other places to visit, more things to do, maps, and tourist information, read Pleasanton travel route planning tool . You can drive from Stanford to Pleasanton in an hour. While traveling from Stanford, expect somewhat warmer days and about the same nights in Pleasanton, ranging from highs of 87°F to lows of 56°F. You will leave for home on the 29th (Sat).